The Apollo program undertaken by NASA was one of true frontier exploration and irrational adventuring. It yielded science many breakthroughs and entertained the world. 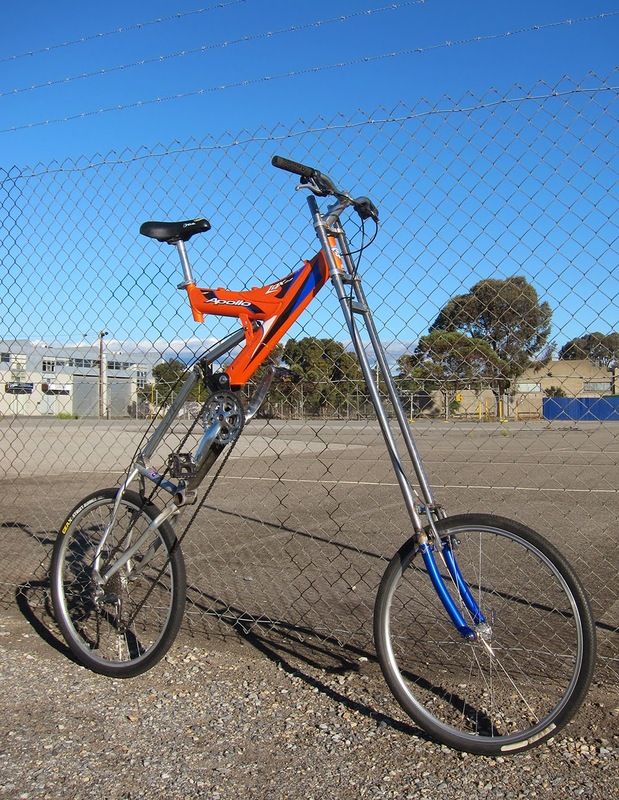 It has also been borrowed as a brand name for an Australian bicycle company. I am currently missing two of my favourite machines as they are locked away in the stark white confines of galleries. This has led me to pondering a number of things - the ongoing rhetoric of whether art objects can be useful (and whether art objects need to be 'not' useful in order to be art)? - what am I going to ride now? and can I further my quest to build a tall bike that can pack down to be transported to other places in the world before beginning an adventure? A design solution epiphany came in the form of realising that when adapting something to break down into smaller parts, why not begin with something that already is constructed of smaller parts? Enter the dual suspension frame design, essentially two parts that are joined together. 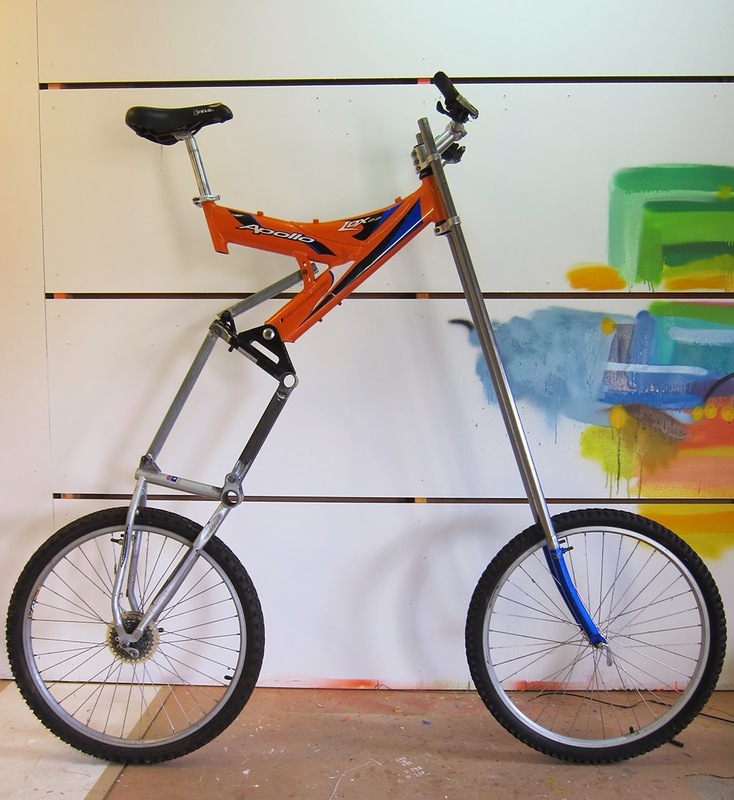 This particular build uses an existing dual suspension design to achieve an outcome that is easily disassembled and packed down into a compact form. The particular design also overcomes a number of other bike nerd problems which I wont go into detail with now. Here's a little step by step of the first phase. Donor bike - sourced via your local friendly Gumtree directory. 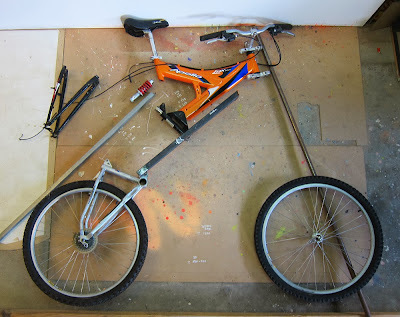 A mid 90's rad machine that has been sitting in the gentle time capsule of someone's shed for twenty years, avoiding the inevitable thrashing that most of these received by eager teens who believed they were in posession of an ultimate downhill bike. Carefully selected for its steel rear end and a host of other handy nuances. 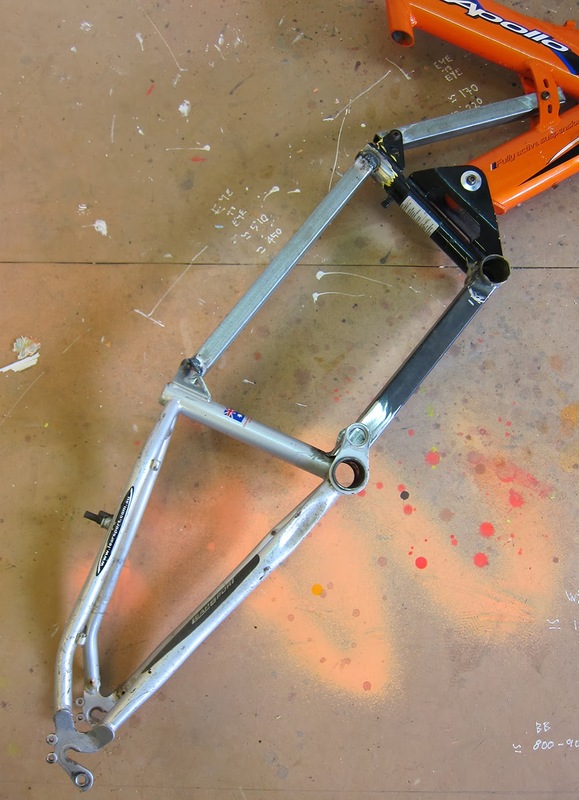 Dissection and loose configuration, with care taken to retain the frame pivot which will become the main point of disassembly. Removal of now redundant rear suspension spring. Fabrication of freshly mutated rear end. Experimentation with angles via cleverly integrated adjustable components. First assembly and test ride. 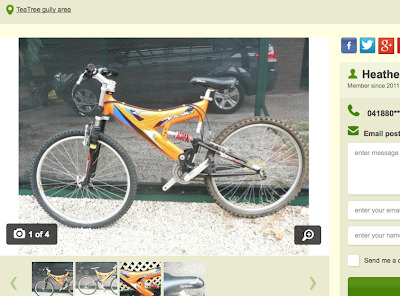 Now all that's remaining is a consideration of carriage potential and which Apollo mission to name the bike after.